NAIROBI (Thomson Reuters Foundation) – Until almost two years ago, James Mbugua, a farmer living in Karai, a village on the outskirts of Kenya’s capital, relied on kerosene to light his house, and a car battery to power his television so he wouldn’t miss the news. According to the International Renewable Energy Agency (IRENA), home solar systems in Africa can now provide electricity for many households for as little as $56 a year – a cost lower than getting energy from diesel or kerosene. “About 60 million people may be using off-grid renewable electricity of some kind in Africa. That is about 10 percent of those living off–grid,” IRENA Director-General Adnan Z. Amin said at a recent off-grid renewable energy conference in Nairobi. 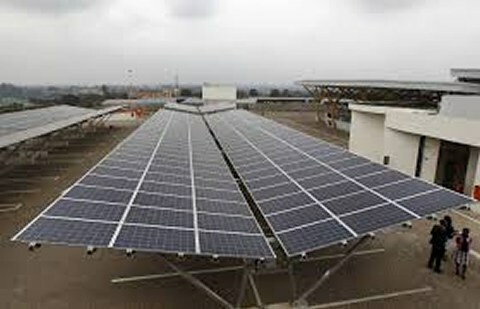 According to Joseph Njoroge, Kenya’s energy and petroleum principal secretary, solar mini-grids – small-scale electricity networks, sometimes combined with wind power as well – are expected to play a major role in bringing electricity to sparsely populated but vast northern Kenya, as well as to other areas not connected to the national grid. “We have a third of Kenya’s population living in the northern part of the country, which is also two-thirds of the total area of the country, and it is here that we shall hugely deploy solar mini-grids to attain universal access to power – possibly even before the year 2030”, Njoroge said. IRENA predicts that ongoing renewable energy innovation, including new business models and finance, will result in a 60 percent decrease in the cost of producing electricity from renewable mini-grids in the next 20 years. Solar home lighting systems – which now cost about $120 for a small-scale system in Kenya – have fallen by as much as 80 percent since 2010, according to IRENA. The agency noted that it expects the trend to continue. In addition to lighting homes for the poor, off-grid renewable energy is being used to power things like health and education facilities, agriculture and water access – helping achieve at least a dozen of the other new Sustainable Development Goals, an IRENA report said. October 11, 2016 in Around the Globe.